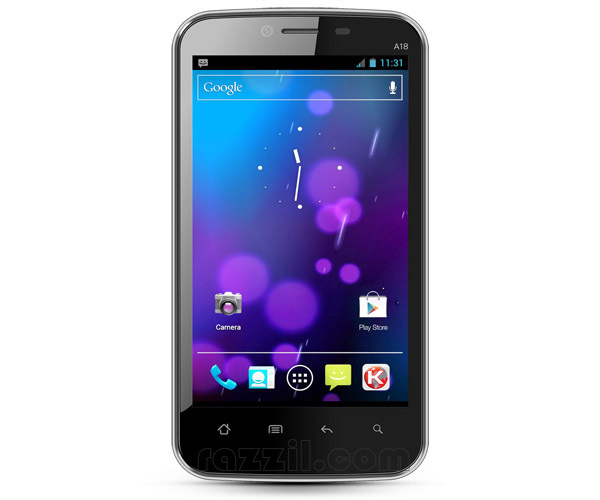 Karbonn Mobiles launched its new affordable Android smartphone in the Indian Market. Karbonn Smart A18 has 4.3-inch multi-touch IPS display, 1 GHz processor, Dual SIM Support, 5 MP Main Camera and 1.3 MP Front facing camera. A18 runs on Android 4.0.3 Ice Cream Sandwich and comes with 1500 mAh Battery. The phone support Dual SIM and it’ll cost just Rs. 12,990 ($233.92). High Definition 5 MP main camera loaded with advanced features like Burst Mode and Face Detection, it also has 1.3 MP Front facing camera for video calling. The phone support Dual SIM where SIM 1 supports 3G and SIM 2 supports 2G. The phone packs with powerful hardware with Android 4.0 ICS OS. The phone also comes with some preloaded apps like Whatsapp (now very popular among Indian users), King Soft Office and PayTM (Recharge mobile, DTH and DataCard right from the mobile).